Denzel Washington And Viola Davis On Adapting 'Fences' And Honoring August Wilson The actors star in a new film adaptation of Wilson's Pulitzer Prize-winning play. Davis says it's "about a flawed man ... who doesn't understand the extent to which he is destroying [his family]." Denzel Washington says his character, Troy, "thinks he can control death and the devil, and he finds out in the worst way that he can't." Washington stars alongside Viola Davis in Fences. 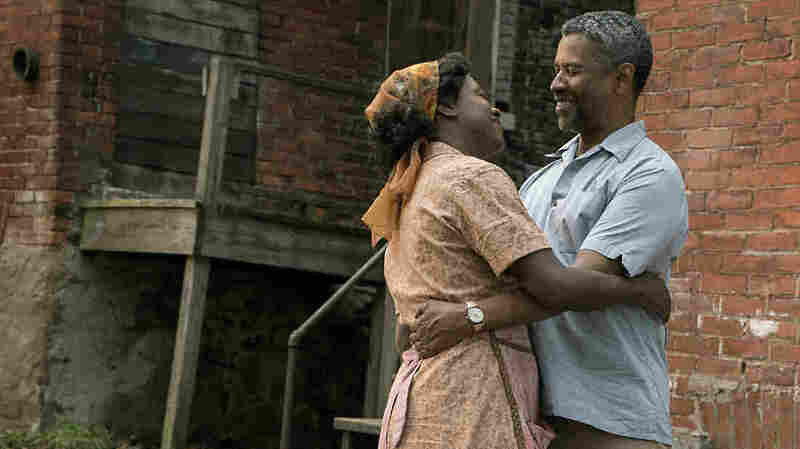 Six years ago, Denzel Washington and Viola Davis starred in a Broadway revival of August Wilson's Fences. Now they also star in the play's film adaptation, which Washington has directed. Fences tells the story of Troy and Rose Maxson, a married couple living in 1950s Pittsburgh. Troy, a sanitation worker, is having an affair, and over the course of the play Rose begins to realize what she gave up by staying with her husband. Fences is part of Wilson's Pittsburgh Cycle, a series of 10 plays that explore the African-American experience in each decade of the 20th century. Wilson won a Pulitzer Prize for the play in 1987, and now both Washington and Davis have received Golden Globe nominations for their performances in the film. The actors spoke to NPR's Michel Martin about what Wilson's work means to them and how they approached their characters. I just really wanted to create a portrait of a woman. ... You see age has affected her, but you still see the smile; you see a little bit of the lipstick; you see a woman who is not downtrodden. It was very important for me to create an entire and specific portrait of a woman, so by the time everything is taken away, it really is taken away. You really feel the trauma ... and I could have only gotten to that level if I would have had something to lose. Denzel Washington: One of the first things I wrote down on the script as I was starting to do rehearsals for the play six years ago — it just hit me, I wrote, "From hell to hallelujah." And early in the play he's always saying, "Aw, hell." Aw, hell this. Aw, hell that. Aw, hell this. And by the end of the play he's screaming hallelujah. So the arc of the character for me was a spiritual arc. If God was sitting there watching, he's saying, "OK, that's as far as he's going to be able to go." And there's a take where Rose, I forgot the line exactly — God's the one you've got to answer to. And I just kind of put my hand over my ears like I don't want to hear it. He thinks he can control death and the devil, and he finds out in the worst way that he can't. Davis: I think that this play is probably the most accessible. I think that when people come to see this they will relate to it in a way that it's [not just] an African-American experience — it's a story about a family and it's a story about a flawed man who is at the center of this family who doesn't understand the extent to which he is destroying it. And I think that that really is at the heart of who we are as people and what we are as family. Davis: To me August honors those men that people just never even talk about; men in history that were invisible. Men like my dad, who was a groom on the race track and born in 1936, had a fifth-grade education. And his only dreams were us, his kids. And he honors him in these plays, and I love that. Washington: I spent one day with him in 2005 and flew up to Seattle. He wanted to meet and we were talking about [the Pittsburgh Cycle play] Gem of the Ocean. But it was just a great day I got to spend with him and ask him questions about how he worked. It had nothing to do with Fences — just ask him his process and just spent the day with him. I had no idea it was the first and the last time I was going to see him, but it was just a lovely, lovely day. Washington: I made a nine-picture deal with HBO. ... I was doing A Raisin in the Sun two years ago, 2014. Constanza [Romero], August's widow, came to the show and after the show we were small talking — and we had already been working on Fences — and she says, "The estate is asking would you shepherd his other nine films?" I couldn't believe it, and I said yes. Washington: If it ain't on the page, it ain't on the stage. What an opportunity we have now, because August Wilson has left us about a thousand pages of his brilliant work, and we have 10 opportunities — the first one now being Fences — to make sure it's not a trend. ... I have enough work for the next 10 years, even if it's just as a producer, but also there are hundreds of actors — African-American and white actors — in his plays that now will have an opportunity to not just work but to interpret a genius' work — one of the five greatest playwrights in American history's work. So I honor that.